NASA's Kepler mission discovered a world, called Kepler-16b, where two suns set over the horizon, just like "Star Wars'" Tatooine. Worlds with twin suns, like Luke Skywalker's fictional home Tatooine in "Star Wars," may be rare because closely paired stars gravitationally hurl planets away from them, a new study finds. Although Earth may orbit a single star, most sun-like stars are binary systems — two stars orbiting each other as a pair. In fact, there are many three-star systems, even going as high as seven-star systems. So far, Kepler has discovered 11 circumbinary planets. This is a small number, given how common binary systems are and how many confirmed exoplanets Kepler has discovered — more than 2,600, at last count. The researchers found that with young stars in binary systems, the gravitational interactions known as tidal forces that each star exerts on its partner slows the rate at which it spins on its axis. This in turn increases the distance at which they orbit one another. In addition, each star's magnetic field compels it to blast material off it. This pushing makes the stars then draw nearer to each other. Computer simulations revealed that these changes in the orbits of the stars destabilize the orbits of planets around them. 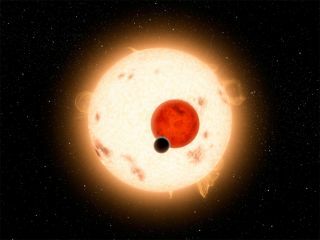 In 87 percent of the simulated binary systems with multiple circumbinary planets, the researchers found that at least one circumbinary planet close to the stars got hurled away from the system. This mechanism for shedding worlds that the researchers examined "provides a compelling explanation for the lack of observed circumbinary planets," study lead author David Fleming, an astrophysicist at the University of Washington in Seattle, told Space.com. "It's not that it's just difficult to detect them, it's that our mechanism actually ejects a large number of them from their systems into deep space, so there's often nothing to detect." Future research will seek to make "more accurate estimates for how many circumbinary planets are ejected into space via our mechanism," Fleming said. The scientists detailed their findings online April 10 in a forthcoming study in The Astrophysical Journal.